Pilkington Optitherm™ is a range of high-performance, off-line coated, low-emissivity glass products, available in various sizes and thicknesses, specifically designed to help save energy when incorporated within Insulating Glass Units (IGUs). 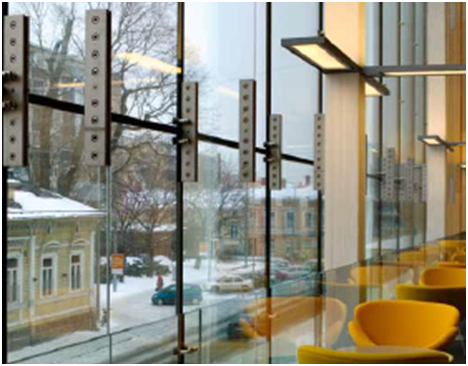 transmittance and low reflectivity – providing its neutral appearance – also make it ideal for use in large glazed areas with demanding design requirements. Extremely flexible in application, this unique glass product can be combined with other products from the Pilkington range such as Pilkington Activ SunShade™ Blue. Providing an ideal solution for improving the internal environment of a conservatory, this glazing combination helps maintain a comfortable temperature whilst also maximising light transmittance. For applications requiring additional benefits such as impact resistance, increased security or improved noise reduction, Pilkington Optitherm™ S1 Plus may also be combined with Pilkington Optilam™ and Pilkington Optiphon™. To achieve Ug-values as low as 0.9, Pilkington K Glass™ OW can be glazed with Pilkington Optitherm™ S1 Plus to achieve triple glazing performance in a double glazed IGU! The unit’s performance can be further incorporated into a triple-glazed IGU, further reducing the Ug value to as little as 0.5 – making it the ultimate solution in thermal insulation. To learn more on Pilkington Optitherm™ range, including more Pilkington Optitherm™ S1 Plus information, please visit our product pages.